Formerly a gymnast, Brooke Bouchard began diving later than most, at the age of 13. Brooke’s home club is Revolution Diving, and she is currently a member of the Manitoba Provincial Diving Team. 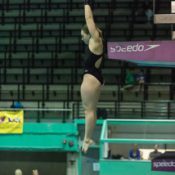 Brooke attended Diving Junior Nationals in 2015, and recently won gold at the Manitoba Provincial Diving Championships in June of 2016. There, she also qualified for the 2016 Senior Nationals. 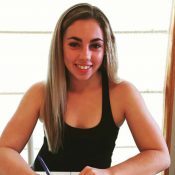 18-year-old Brooke graduated from Grant Park High School last year, and has just finished her first year at Florida International University in Miami, where she is continuing to train and compete. WINNIPEG FREE PRESS (June 18) At 17, Winnipeg’s Brooke Bouchard is already making a splash in the national diving scene.